NaBloPoMo Day 9. TODAY, THE UPS DELIVERED A BIG BOX of pecans, fresh from the pecan orchard harvest in Georgia (sunnylandfarms.com). 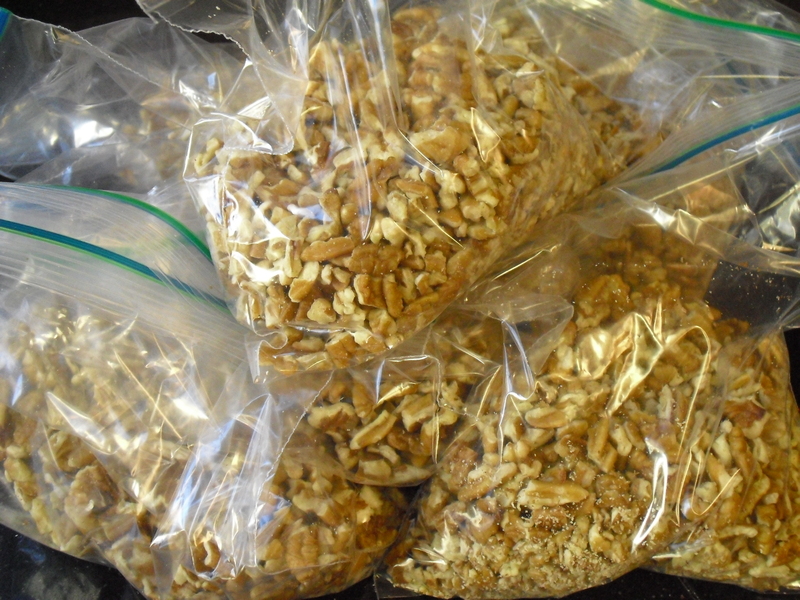 I buy pecans (and walnuts) in bulk, when they are harvested in October and early November, and at their peak of freshness. The nuts keep their freshness best in the refrigerator or freezer. The small bags of nuts in the grocery grow stale in their little bags – and there is no comparison to the taste of those nuts and freshly harvested nuts. 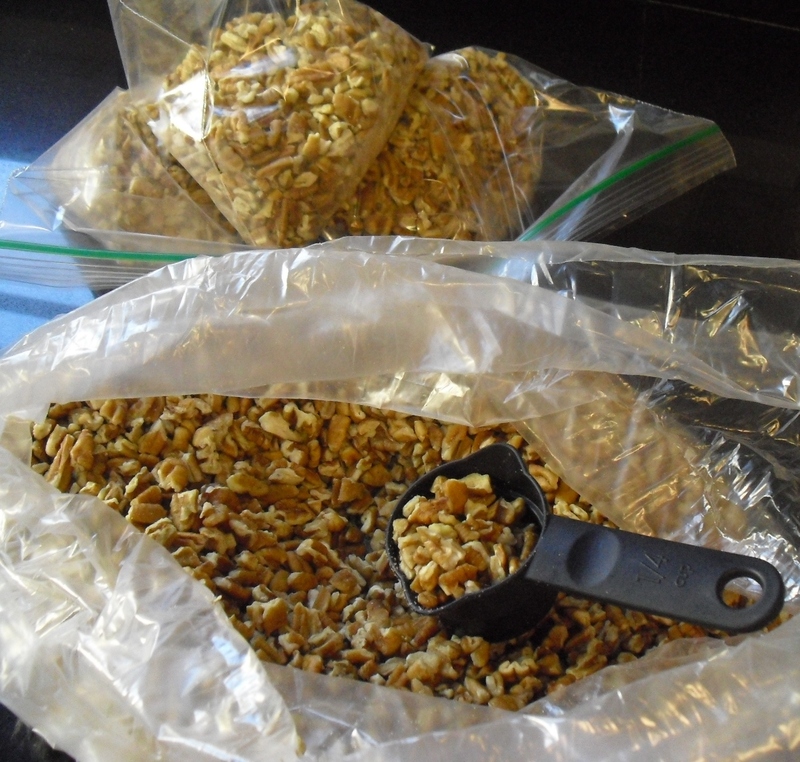 I freeze the pecans in small bags, so I can remove just the amount I need. THE PECANS ARE HERE, so I decide to put on my baking apron. I typically plan several baking days in November to make cookies, muffins, fruit pies and cake layers (to be assembled later), to add to the freezer – so I have a lot of different sweet treats for the holidays – ready to go. MY THOUGHTS DRIFT TO my Aunt Shirley and her oatmeal cookies. Aunt Shirley was married to my mother’s brother Steve. When I think of her during the years I was growing up, I think about her in the kitchen with a smile and a song. When she came to visit, it wouldn’t be long before she was in our kitchen cooking up something. She loved her home and her kitchen – and was the only person I ever knew who truly enjoyed washing dishes. “I just love to see them shine and my kitchen put back in order”, she would say. She would wash dishes and sing along with the radio. She also was the only person I knew who loved country music- (we had big band and popular music on at our house most of the time). 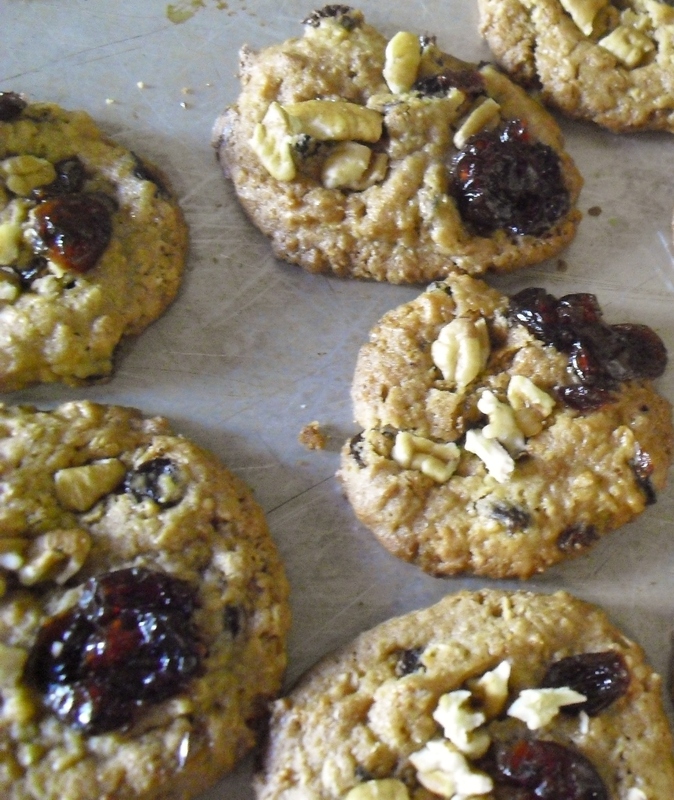 I HAVE VARIED the oatmeal cookie recipe many times, such as adding peanut butter or butterscotch chips. I like to make them, as it goes so fast, dropping them from a spoon to the baking pan – no rolling or cutting. I decided to create something different today. I view cooking as a creative process and more enjoyable if I have fun with it. 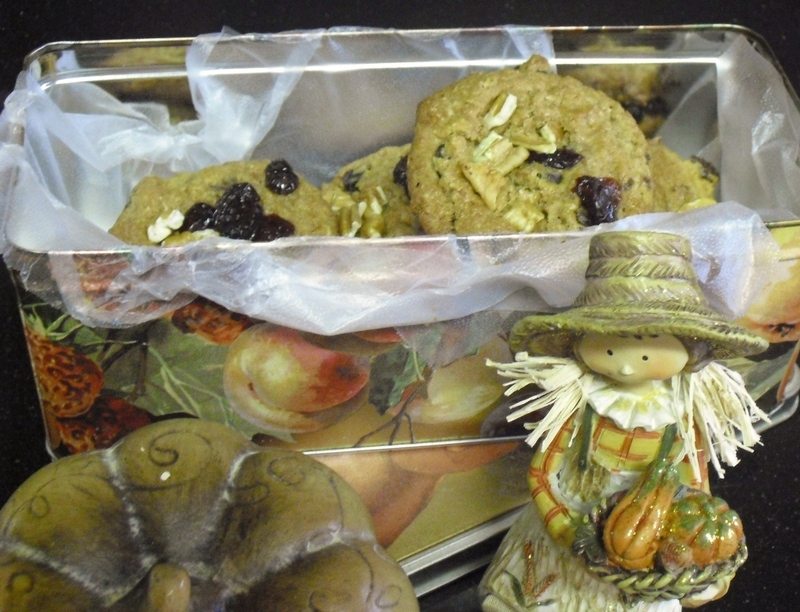 I PULL OUT THE OLD RECIPE for oatmeal cookies that my dear Aunt Shirley made so many times. This recipe comes from her cookbook, The Modern Family Cookbook by Meta Given, J.Perguwson and Associates, 1942. Her cookbook easily falls open to page 412 with the oatmeal cookie recipe. I decide to punch up the recipe with a little cognac, brown sugar and cranraisons. PLACE CRANRAISONS in a glass cup, add cognac to cover, microwave for 1 minute – then set aside. Cranraisins will be plump and juicy with cognac flavor. SIFT FLOUR, measure and sift again with salt, baking powder and cinnamon. Cream butter with sugar. Add slightly beaten egg. Mix well until smooth and light. Add oats. Add milk and flour gradually, stirring after each addition. Add nuts and now plump cognac cranraisins and mix well. DROP COOKIE DOUGH from a teaspoon onto a buttered baking sheet. Bake for 10 minutes, or until just starting to brown. THANK YOU AUNT SHIRLEY for your cookies, the memories and your love for the children of our family. WHAT IS ONE OF YOUR FAVORITE COOKIE MEMORIES?